With A&N Lawn Service Inc., you’ll find we offer much more than just lawn care! We are the leading Ross Township residential and commercial landscaping company, with over 20 years’ experience and countless satisfied customers all over the North Hills communities. Residence of the North Hills are no strangers to their hilly landscape. Many homes and businesses rest atop the sprawling, mountainous terrain we call Western Pennsylvania. With this, comes hillside erosion and land instability. At A & N Lawn Service, we are experts in constructing Ross township retaining walls to support existing hillsides and newly developed landscapes. We incorporate functionality and aesthetic by creating structurally sound retaining walls with terraced gardens and cascading plant life. Homes in the North Hills area are made up of an array of urban and wooded landscapes. That’s why many residents are reaching out to A & N Lawn Service to create a unique backyard space for retreating and entertaining. Whether you want to add a small patio with LED lighting or a stately courtyard complete with a custom-made stone fireplace and outdoor kitchen, contact the design specialists at A & N Lawn Service Inc. and transform your backyard today with Ross Township Hardscaping Services! At A & N Lawn Service Inc., we know you lead a busy life. Let us help with the yard work! 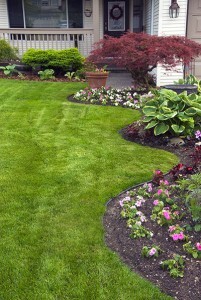 With A & N’s Premier Lawn Care Service, we offer customized lawn care packages to fit your budget. Please visit our Maintenance page or contact us at 412-931-9230 to learn more about our commercial and residential lawn care packages in Ross Township! Designing and maintaining a beautiful landscape is as easy as 1-2-3! At A & N’s Landscaping Services we provide all-season landscaping services, including planting, mulching, seeding, thatching, and aeration. We also provide spring & fall clean-up services, along with outdoor lighting installation, irrigation systems, and tree or stump removal. Visit our Landscaping Services page for more information! Ross Township is home to one of the busiest and most continuous shopping districts in the Greater Pittsburgh area. With Route 19’s McKnight Road Corridor transitioning into Perry Highway, this extensive network of shopping centers, restaurants, medical facilities, fitness centers, schools, and universities stretch from Ross Township to McCandless and beyond. Snow and ice removal are pertinent to the safety of your tenants and occupants. Prevent personal injury by utilizing A & N’s Snow Removal Service to keep the roads, sidewalks, parking lots, driveways and loading docks of your property free of snow and ice. A & N Lawn Service’s offer’s 24-Hour Commercial Snow Removal program. Depend on our professionals for timely and reliable snow-removal.